You are here: Home / Jewelry / bracelet / Summer Sizzle, Shimmer, and Shine! Summer’s here! The hottest season, the brightest season, the most intense and passionate season, summer allows us to shine! The summer sun gives its most brilliant light to us throughout June, July and August — the least we can do is return the favor by donning exquisite pieces of equestrian jewelry! Gold reigns supreme in the summer: bright and bold, it captures the fire, passion and energy of the wearer. 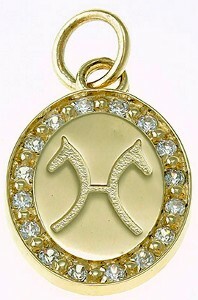 Striking style is essential for summer: consider this 14k Gold Hanovarian Breed Charm Surrounded with .40 carat weight of diamonds, the Hanovarian emblem will instantly let others ‘in the know’ take notice of and appreciate your love for your horse! 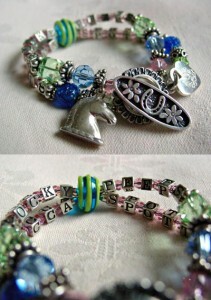 Summer is about individuality, which is why a wide range of breed charms are available. 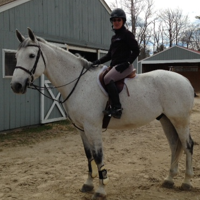 In addition to the Hanovarian charm, there are Holsteiner, Trakhener, Oldenburg, Dutch Warmblood, Westphalian, American Warmblood, Swedish Warmblood, Belgian Warmblood, Irish Sport Horse, and Selle Francais Charms available. All feature the stunning gold styling, bold, bright and beautiful, and all are set with .40 carat weight of diamonds. Summer’s also about the flash and fun and good times — all the while celebrating the individuality of the horse lover! That’s why this piece of horse jewelry is so great — for riders of almost any age! The Dazzle Namecube Bracelet features hand blown glass, blue, green, and pink Swarvoski crystals, larger hand blown pink and blue glass beads, and silver Bali beads — along with up to four names, spelled out in beads. The piece can be further personalized with an engraved silver heart charm: a great gift for a riding instructor or team coach!